Here I'm wearing a hi-lo dress from RingBells shop (via Facebook) which I paired with a cropped crochet cardigan from Cowgirl Heaven via Etsy. The shoes are from Payless, the gold bracelet is from De Moda, and the necklace is from (X).S.M.L. If you want to go more casual but still looks presentable, here's an idea for you. 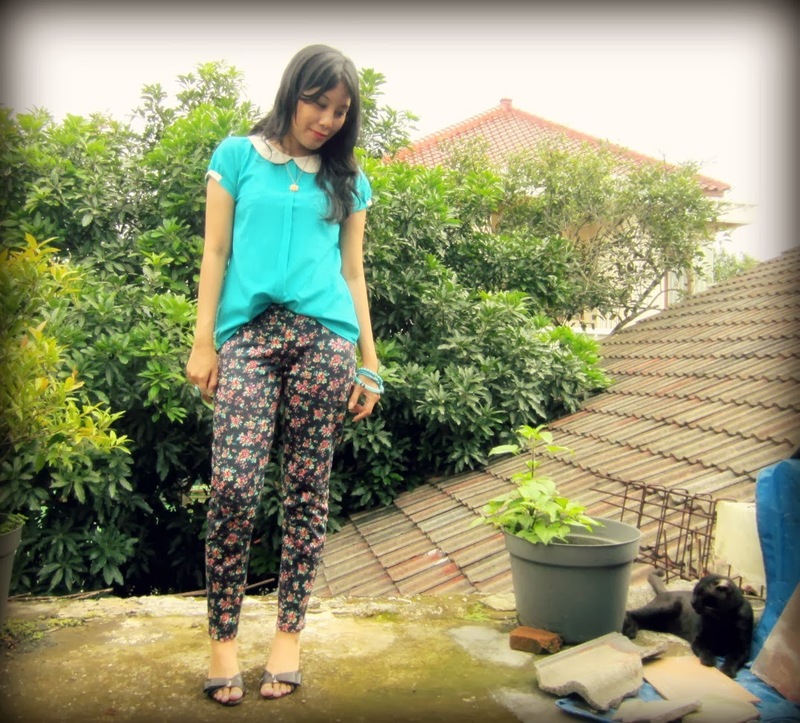 Printed pants are still on the trend right now so why don't you opt for your floral printed ones. Pick a color from the printed pants and wear it as your top. Here I'm choosing a green turquoise color as the top that matches one of the colors from the floral print. In the photo I'm wearing a turquoise peterpan collared top (also) from Ringbells (via Facebook), and the printed pants are one of my favorite ones from Uniqlo. The sandals are my trusted (and rusty) Charles & Keith sandals and the peach floral necklace is from Forever 21. Other accessories include a turquoise bracelet set from Chicnova and a turquoise ring that I scored from eBay. I actually already wore this outfit twice, and it's perfect for date night. The most recent I wore this outfit is a few days ago. If you follow my instagram you might have seen this outfit first. The pretty rainbow dress is from Oasap (thank you!) and the cardigan is part of a twinset that my cousin gave me a long time ago. The beautiful blue necklace is one of my cheap findings from eBay, and the clutch is a birthday gift from my besties a long long time ago. So what would you wear this Valentine's day? Also, if you like home decor don't forget to check out my other blog TIGERLILY'S BOOK for some ideas on how to decorate your rooms for Valentine's day.